Yogurt (also spelled “yoghurt”) is a fermented dairy product made by adding live bacteria culture to milk or cream. The process of making yogurt is simple: the bacteria, or yogurt cultures, ferment the natural sugars found in milk, creating lactic acid. The lactic acid then causes milk proteins to curdle, giving yogurt its signature sour flavor and thick consistency. Yogurt can be made from any type of milk or cream, but the healthiest variety is plain, unsweetened yogurt since it has the most nutrients and the least additives. The probiotics, or friendly bacteria, in yogurt make it a highly beneficial drink. One type of probiotic in particular, Bifidobacteria, is notable for its ability to synthesize vitamins and promote better digestive health. Because yogurt is made from milk, it’s loaded with the necessary nutrients for strong bones. Calcium, vitamin D, potassium, and phosphorus are essential for bone mineralization, and for preventing osteoporosis. The stronger the bones, the less prone they are to weakening and breaking. Plain, unsweetened yogurt is best due to other varieties having sugars or artificial sweeteners added to them, making them harmful when eaten in excess. The taste of plain yogurt can be off-putting to some, but this is easily remedied by the inclusion of fresh fruits, maple syrup, or honey. Yogurt can be incorporated into a multitude of recipes. Hummus, soups, marinades, and salad dressings are good places to start. Yogurt can be used in place of butter or oil when baking breads, cakes, and pies. Additionally, yogurt can serve as a sour cream substitute for topping tacos and baked potatoes. Note: Heat will kill the friendly bacteria in yogurt, minimizing its health benefits. To get the most out of this dairy product, eat it as is. Yogurt can act as an exceptional antibacterial agent for the digestive system. The probiotics can decrease the levels of bad bacteria in the gut to balance out the intestinal flora, as well as the risk of digestive ailments like constipation and diarrhea. Yogurt aids the gut further by encouraging a smooth and expedient digestive process. Yogurt is high in protein: 12 grams of protein can be found in seven ounces of unsweetened yogurt. Proteins are necessary for metabolism and for controlling the appetite, so yogurt can boost metabolic rate and even aid in weight loss. People suffering from lactose intolerance will usually find yogurt to be more tolerable than milk because of its low lactose content. 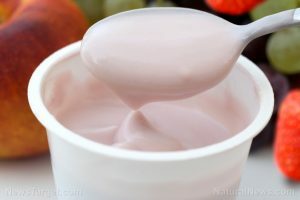 Though its still best to try a small amount of yogurt first to gauge how the body will react to it. Milk allergy sufferers should avoid yogurt entirely. Whey and casein, milk proteins that trigger allergic reactions, are found in all milk products, yogurt included.